Science can benefit more from design than design from science. Design and science have an uneasy relationship. Or, to be more more precise, design has an uneasy relationship with science. Science on the other hand has almost no relationship with design and tends to happily ignore the excitements and commotions of the design world. Historically, design has been fairly unscientific. As the name suggests, the Arts and Crafts movement, which is one of the foundations of modern design, was closer to fine art than to science. Designers and artists are often taught in the same department at university and share a similar mindset. Throughout the 20th century, art has inspired design — and sometimes vice versa. For many, design was primarily a strive for elegant and expressive aesthetics for the products and objects that surround us in our everyday life. So historically, design is much closer to fine art than to science. But things are not that simple. While aesthetics were, and are, the focal point of design — science and engineering always played an important role in the history of design. Scientific discoveries led to new technologies, new materials and new social spaces. But it was engineering and design that made these technical innovations accessible and affordable to a wider public. So one could argue that design makes scientific progress visible and usable. This process was not limited to the natural sciences. In 1925, Otto Neurath created the »Vienna Method of Pictorial Statistics« which in 1934 became ISOTYPE — the International System of Typographic Picture Education.Together with the designers Marie Reidemeister and Gerd Arntz, Neurath wanted to create a new visual language that sought to explain the complexity of the world in pictorial form. Their aim was to communicate social and scientific data in a form that was understandable by a wider public. A typical example of an ISOTYPE information graphic. Note the conveyor belt on the left! Otto Neurath was an ardent logical positivist. He believed in empirical observation and in creating rational foundations for philosophical discourse. He was famous for interrupting philosophical debates by shouting “metaphysical!” if an argument was not rooted in empirical observation. So he was certainly not someone who was interested in expressive aesthetics and an artistic interpretation of design. 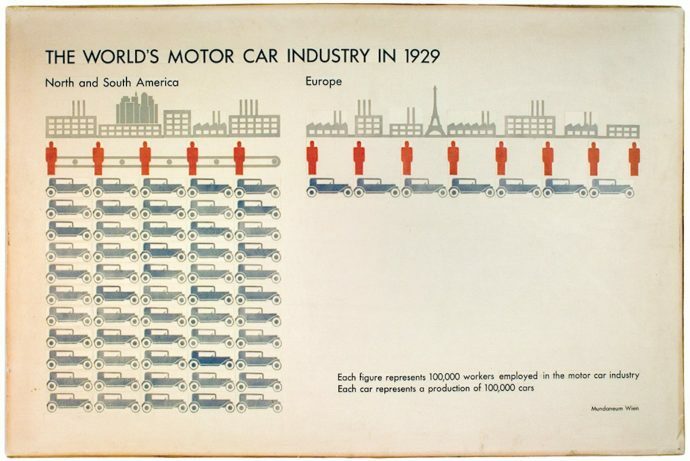 And yet, ISOTYPE is a very important milestone in the history of graphic design. The great achievement of ISOTYPE was to communicate complex statistical data through a formalised visual design language that enabled the viewers to quickly understand the relationship of symbols and data. In his seminal book International Picture Language, Neurath states that visual languages cannot replace verbal languages — but he also demonstrates the power of signs and pictures when it comes to explaining a complex process or conveying statistical data. So ISOTYPE is one of the earliest attempts to use design in order to communicate scientific data — in this case mainly from the social sciences and from history. This “rationalistic” approach to design was later also pursued by the HfG Ulm (Hochschule für Gestaltung Ulm / Ulm School of Design). In 1953, the HfG Ulm accepted the first students. Right from the beginning it was clear that it would not just deal with superficial aesthetics. Design had a social and political responsibility. And the only way to address this responsibility was by becoming more objective — and more scientific. An essential part of the design education in Ulm was the to create a theoretical foundation and a rational reason for design decisions. Furthermore, not only the approach to design problems was methodical but also the aims and objectives of the design process. According to the ideas and ideals of the HfG, design should participate in the social and intellectual progress. It is the object of academic debate whether the design approach at the HfG Ulm was “scientific” — but it is safe to say that it introduced a form of intellectual questioning into the design process that is still valid today. The scientific community was never particularly interested in the design world. But in the second half of the 20th century, it was recognised that science had a communication problem. In 1985, the Royal Society published a highly influential report with the title The Public Understanding of Science. The report recognises the importance of communicating the results of scientific research to a wider public. While mentioning the term “design” just occasionally, the report has strong implications for the relationship between design and science. The responsibilities for design are fairly obvious. Communicating the history, the process and the results of science to a wider public is an immense design challenge. In this context, design offers great powers and possibilities. Be it the creation of a museum exhibit, the design of an information graphic or the interactive simulation of an experiment, design can convey scientific insights in an intelligent, informative and delightful way. In order to achieve this, the designer has to work closely with scientists and communicators and convey the right message and the right amount of complexity. In this sense, design interprets science and transforms the interpretation into a concrete artefact. This interpretation is very much about finding an appropriate textual, visual and interactive form for a scientific statement. However, it is important to note that this process cannot be a one-way-road. There are also responsibilities of science in this process. While the report The Public Understanding of Science states that “it is clearly a part of each scientist’s professional responsibility to promote the public understanding of science” it also recognises that “within the scientific community there is still often a stigma associated with being involved in the media”. Thirty years later this is still true. Every designer who has ever worked with scientist knows that creating science communication is indeed a tricky business. We have to recognise that the scientific progress has reached a level of depth and complexity that it is hard to explain and to communicate every aspect.String theory is simply not trivial. Climate research deals with lots of uncertainties. Furthermore, science is highly specialised. There are a multitude of scientific disciplines and sub-disciplines. And even neighbouring disciplines sometimes do not understand each other. But we also have to recognise that in order to achieve a better public understanding of science, the scientific community needs to engage more with writers and designers. If science wants to play a more active role in public debates, popular culture and universal education, it needs to adapt and gain a greater awareness of design strategies. Public understanding of science is a collaborative effort. And in this effort, design plays an important role. So in the past, the relationship between science and design was dominated by attempts to make design more scientific and to employ design to make science more understandable. This is all good and well. But I think design can do more. I believe design can make contributions to the scientific progress itself. Design can and should be part of science. Instead of bringing science to design, I would suggest to bring design to science. Design — and especially interaction design — has many qualities, strategies and methodologies that can make substantial contributions to the scientific progress. This statement is probably surprising — if not irritating — to many people as “design” is still associated with things like marketing, advertising, superficial aesthetics, luxury and commercialism. While this association is not entirely wrong, it completely ignores the aspects of design that are extremely valuable for science: innovation, user-centredness, deep aesthetics, problem solving, contextual awareness. And as I have pointed out before, even the intuitive aspects of the design process are not irrational. Instead of explaining these aspects in all detail, it is probably better to demonstrate the power and possibilities of design in the scientific context by illustrating this statement with concrete examples. At the Interface Design programme in Potsdam, we have been collaborating with scientists for many years. With our designs, we contributed to scientific projects and created new qualities in the scientific work. The following design projects address and demonstrate the power and possibilities of design in science. In his MA thesis, Roman Grasy collaborated with a team of researchers that are exploring the possibilities of 3D bio-printing. He identified a number of research questions and problems that could be solved by design. As he was fully integrated into the team, he worked very closely with the researchers and created a number of relevant contributions for the project. Bio-printing is a fairly new technology. It allows for the additive manufacturing of living tissue and is currently used to create individually designed mini-organs. Further developments of this technology aim at printing fully functional organs for medical transplantations. The printer used in this project was the Cellbricks Cellmaker, which uses stereolithography and specific bio-inks to print complex mini-organs. It has a resolution of up to 10μm. 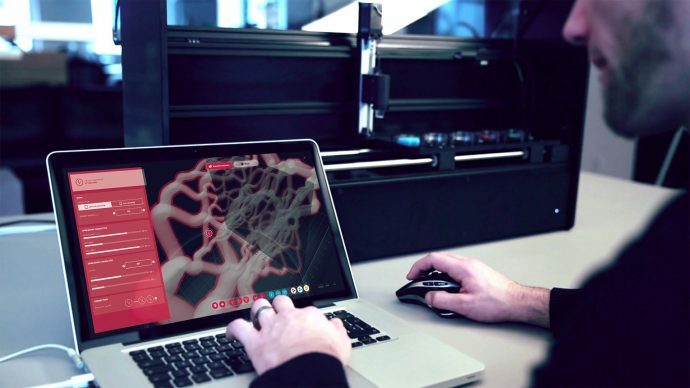 Software prototype of “Bloodline Alpha 1” beneath the Cellbricks 3D bioprinting machine. The starting point for the thesis was the design of a modelling software interface for the 3D bio-printer. While this was already a challenging topic and advanced into the application prototype “Bloodline Alpha 1”, the thesis quickly developed into a more complex investigation. Roman addressed many questions relating to the shape of the organoid data bodies. He applied generative design principles to the vascular aspects of the organoid bodies and created a parametric system that enabled him and the research team to create a large number of different models that are all based on the same generative principles. This setup formed a flexible but controlled environment for further experiments. 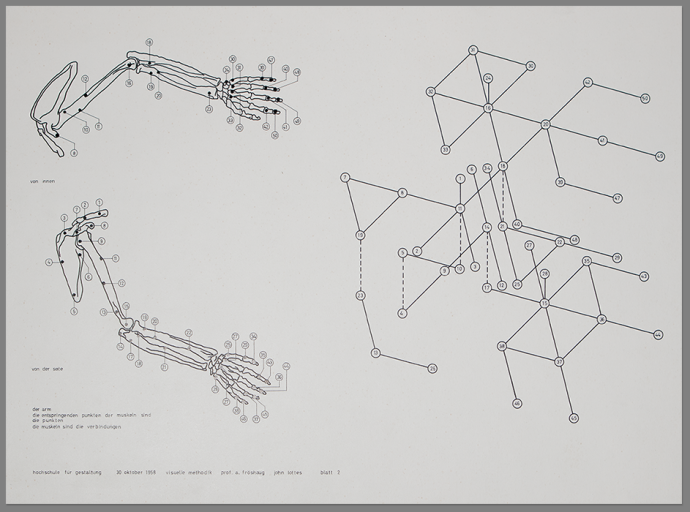 Impressions of generative designed vessel systems. The setup was reflected in the interface and interaction design of the main software application for the modelling of the organoid data bodies — or “organ bricks”. Based on the insights generated in the development of the system and the software interface, Roman was able to take the design questions a step further. He addressed the speculative question of how printed organs could possibly look and work like if they exist outside the human body. Our organs are a repetition of patterns on complex organic surfaces within three dimensions. These patterns are based on the arrangement of functional units within the dense space structures of the human body. The “Organ Generator” demonstrates the relevance of including designers in a scientific research team. The scope of the project and the quality of the results are strongly influenced by the design contributions. In this project, design is not just about reflecting scientific insights and optimising a software interface. Design explores the inherent questions and possibilities of the project. This way, design influences science — and vice versa. In the last few years, a number of cultural institutions have digitised their collections. In many cases the media databases, in which the collections are stored, contain detailed and highly refined content. But the databases often lack adequate interfaces for working with the digitised material. There are not enough tools for exploring, visualising, organising and understanding cultural collections that support academics in their work. The aim of the research project VIKUS is to investigate the role of data visualisation and graphical user interfaces in the exploration and examination of digitised cultural collections. Our team of researchers design, develop and evaluate interactive systems that support scientists and academics who work with cultural collections. One of the outcomes of the VIKUS project is the interactive visualisation VIKUS Viewer in the implementation of »Past Visions«. The visualisation is based on a digital collection of drawings by Frederick William IV of Prussia (1795–1861). The drawings reflect his personal ideas on art and architecture as well as literary influences or contemporary events like wars and revolutions. The database contains 1492 high-resolution images of the drawings and sketches and corresponding metadata. The interactive visualisation provides the users with a number of ways to organise, explore and contextualise the images. It is realised as a dynamic canvas on which the drawings are arranged by year or similarity. Tools for interactive filtering and for zooming make the visualisation highly flexible and very powerful as the users can seamlessly move from high-level overviews to clusters and close-ups. This setup allows the cultural scientists to see and explore the collection along temporal and thematic aspects while not abstracting the individual drawings into aggregated shapes. The interactive visualisation reveals both temporal and topical structures in the collection and provides a way to examine the high-resolution scans of the individual drawings. The VIKUS Viewer provides cultural scientists with an innovative, valuable and efficient way to work with digital cultural collections. It is a well-designed tool for scientific research and generates new insights that would otherwise be lost or invisible. Just as engineering provides scientists with new technological tools for measurement, recording and analysis, design provides science with new conceptual tools for the exploration and evaluation of data. By Julian Braun, Dr. Elmar Kriegler, Prof. Boris Müller et al. Climate change is one of the most dramatic challenges of the 21st century. It is particularly insidious as it is a gradual process that takes place over many years. Climate change is only widely discussed when catastrophes like hurricanes or massive floodings occur. But it is a serious threat to global stability and it needs to be understood and acted upon. Greenhouse gas emissions are one of the driving forces behind climate change. 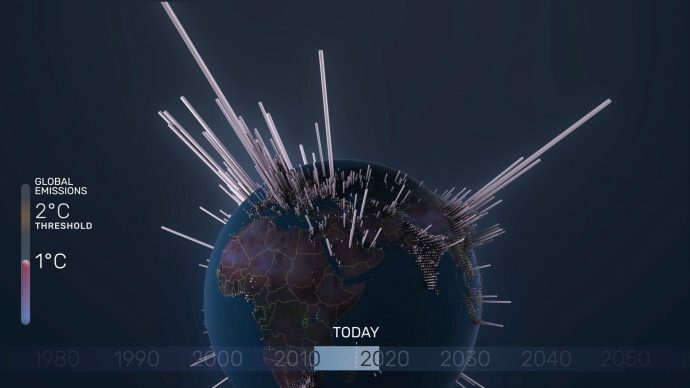 Together with the PIK, the Urban Complexity Lab of the University of Applied Sciences Potsdam designed and developed a short movie on CO2 emissions and on global warming. In our film “A Brief History of CO2 Emissions”, we visualize the geographic distribution and the historic dimension of carbon dioxide emissions. We literally wanted to show where and when CO2 was emitted in the last 250 years — and might be emitted in the coming 80 years if no climate action is taken. By visualizing the global distribution and the local amount of cumulated CO2, we were able to create a strong image that demonstrates very clearly the dominant CO2 emitting regions and time spans. The format of a short film gave us also the opportunity to provide context and tell a story. 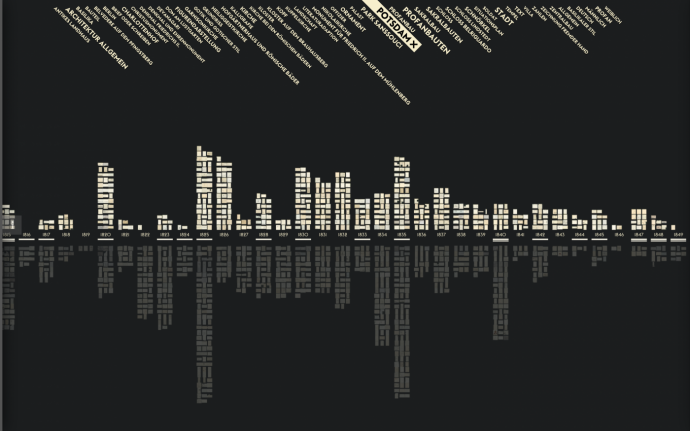 So the data is not only visualized but also part of a narration. We believe that this combination of facts and storytelling is a great format for informing a wide audience about the causes and effects of climate change. Our aim was not only to raise awareness for climate change but to relate factsand data. This was only possible by collaborating with climate scientists. The team from PIK choose the most recent and authoritative data sources on the topic. One important source was data from the Carbon Dioxide Information Analysis Center. It provides the longest time series of gridded (i.e. spatially distributed) CO2 emissions from fossil fuel combustion and cement manufacturing. While our short film is essentially science communication and a good example for “the public understanding of science”, the collaboration with the researchers from the Potsdam Institute for Climate Impact research proved to be insightful and inspiring for both sides. It triggered the SENSES project that will address issues of visualising global climate change scenarios on a larger scale. Science is one of the most important foundations of our modern world. This is not only true for the natural sciences but also for the humanities. Originally, design stood between the arts and engineering. But with the rise of digital technology, it has become more relevant for a wider range of topics and issues. We have reached a point where design — as a discipline — can contribute to the scientific progress and has indeed become part of science. One of the most important contributions is certainly visualisation in its broadest sense. Designers are image-makers. And today, images play a very powerful role in science communication and in scientific work itself. If your scientific work involves images of any kind, you are dealing with design questions. Treating these questions with scientific integrity requires designers. But beyond image-making, design can also play an important role in scientific work. Designers are trained as problem solvers and (co-)creators. 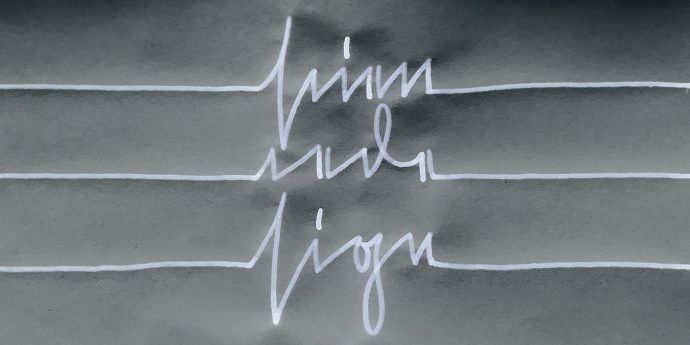 As the project “The Organ Generator” has shown, designers can generate valuable contributions within a research project. So science should engage with design — and vice versa. In order to make this happen, both communities need to open up more and engage each other. The scientific community should understand “design” not only as an aide in the sense of “public understanding of sciences” but also as a contributor to the scientific work itself. But the same is also true for design. If design is going to take on a greater responsibility in the world, it needs to engage more with scientific disciplines and bring the qualities that are inherent in design to the sciences. This will leave design not unchanged. It will challenge the way we teach and practice design today. We will need new spaces where design and science can meet on equal terms. We will need new forms of research funding that requires the inclusion of the designers. We need an awareness for the potential of excellence in the science-design collaboration. I strongly believe that designers as communicators, problem-solvers, image-makers, creators and co-creators can make relevant and valuable contributions to the scientific progress. This essay was reviewed by my colleague Marian Dörk. He is a trained computer scientist – and I am a trained interaction designer. By jointly running the Urban Complexity Lab, we are a living example of a successful science–design collaboration! “Bringing Design to Science” was originally published on Medium on 22 October 2017.